We carry a large range of sprockets in both British and American Standards. Naismith Engineering stock a large range of sprockets, most of the pinions have flame hardened teeth. Weld on hubs are also available from stock, so many non standard sprockets are easily made up into taper bored sprockets. 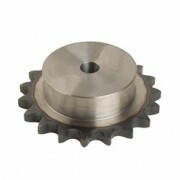 Special steel and stainless steel sprockets are manufactured in our own factory. A.S.A. Simple & Plate Wheels 1/4" up to 2 ½"
A.S.A. Duplex 3/8" up to 1 3/4"
A.S.A. Simple Taper Bore 1/2", 5/8", 1" & 1 1/4"
Receive the monthly e-newsletter with up-to-date product information.